SALUTE TO THE COMMANDER-IN-CHIEF: Sailors saluting President A.P.J. 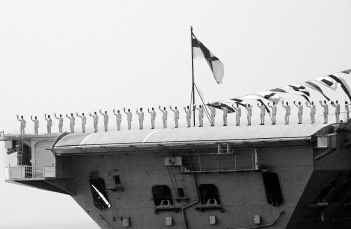 Abdul Kalam from the aircraft-carrier, INS Viraat during the President’s fleet review off Visakhapatnam on Sunday. VISAKHAPATNAM: President A.P.J. Abdul Kalam on Sunday underlined the growing importance of the Navy in the country’s strategic planning and urged it to pay more attention to the "fourth dimension," or the utilisation of space, to assist national development. Attending his first review of virtually the country’s entire armada, Mr. Kalam said the focus was shifting to naval operations because of a whole range of activities along the coast. The Navy was required for securing oil exploration, increased cargo tonnage, growing importance of the oil expressway, and increasing traffic in the narrow corridor of the Malacca Straits. The Sethusamudram project would further extend its sphere of activity. Addressing navy personnel aboard an off-shore patrol vessel in the Bay of Bengal, he said his review "gives me the confidence that the nation is assured of its maritime security." He was confident that the Navy would provide the necessary assistance and security cover in the entire region and be a partner in national development missions. However, the Navy should not restrict itself to three dimensions - undersea, on sea and in the air. He defined the "fourth dimension" as utilising space through communication satellites and reconnaissance satellites. Full advantage may be taken of the services provided by indigenous satellites for surveillance, and harnessing and estimating ocean resources and environment. The President’s observations come against the backdrop of the Government placing import orders worth Rs. 25,000 crore to modernise the Navy. Besides, indigenous shipyards had been asked to build more combat ships. Describing the Indian Ocean as a "national treasure," Mr. Kalam said the economic growth of the entire region depended on heavy transportation taking place through the sea lanes. The Navy had an increasing role in providing the necessary support for carrying out these operations. Its contribution had already increased four times in the area of surveillance and protection of the country’s maritime assets. In addition, it had contributed to waterway development by charting the deep water route in the Gulf of Kutch, thus enabling the faster movement of crude oil. While appreciating the Navy’s accomplishments, he asked it to be prepared to meet additional responsibilities in the future. The area under exclusive economic zones would increase by two million sq km, and the Navy should work closely with other Government agencies to ensure adequate jurisdiction over this additional area. Through its surveillance systems and by utilising the "fourth dimension," the Navy should also help in combating ecological disasters. It could detect surface and under-surface slicks and provide real time information to marine biologists to take steps to conserve the living and non-living resources of the sea.